Project EverGreen’s Healthy Turf. Healthy Kids. Project EverGreen traveled to Walker Elementary School in Ashland, Ore., to give the athletic and recreation fields a needed renovation. As part of its “Healthy Turf. 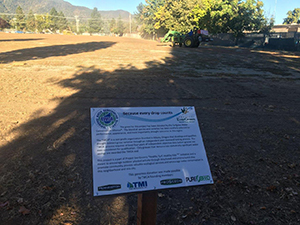 Healthy Kids.” initiative, Project EverGreen partnered with the Turfgrass Water Conservation Alliance, and volunteers from the Southern Oregon Landscape Association, Ashland School District and the Ashland Little League to complete the project. The project covered more than 139,000 square feet of turf and started with cleaning up debris from the playing surface. This was followed by weed removal and application of weed control products, soil aeration by volunteers from the Southern Oregon Landscape Association, and overseeding with more than 2,000 pounds of drought tolerant seed and top-dressing donated by the Turfgrass Water Conservation Alliance. The renovated playing surfaces will provide the Ashland Little League with a safer playing surface on which to host games, as well as enable the league to start a new division and increase participation levels. The maintenance staff at Walker Elementary has committed to the long-term success of the program by incorporating sustainable water-smart irrigation practices and agreeing to manage the overseeding process over the next two years.